Rubus armeniacus is a perennial plant that bears biennial stems ("canes") from the perennial root system. In its first year a new stem grows vigorously to its full length of 4–10 m, trailing along the ground or arching up to 4 m high. The stem is stout, up to 2–3 cm diameter at the base, and green or reddish-tinged above if it is exposed to bright sunlight. The leaves on first year shoots are 7–20 cm long, palmately compound with five leaflets. The leaflets are moderately serrated. Flowers are not produced on first year shoots. In its second year, the stem does not grow longer, but produces several side shoots, which bear smaller leaves with three leaflets (rarely a single leaflet). These leaflets are oval-acute, dark green above and pale to whitish below, with a toothed margin, and thorns along the midrib on the underside. The flowers are produced in late spring and early summer on panicles of 3–20 together on the tips of the second-year side shoots, each flower 2–2.5 cm diameter with five white or pale pink petals. The flowers are bisexual (perfect) containing both male and female reproductive structures. The species was introduced to Europe in 1835 and to Australia and North America in 1885. It was valued for its fruit, similar to that of common blackberries (Rubus fruticosus and allies) but larger and sweeter, making it a more attractive species for both domestic and commercial fruit production. The cultivars "Himalayan Giant" and "Theodore Reimers" are particularly commonly planted. 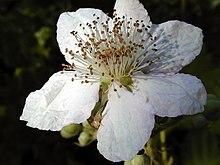 Rubus armeniacus was used in the cultivation of the Marionberry cultivar of blackberry. Rubus armeniacus soon escaped from cultivation and has become an invasive species in most of the temperate world. Because it is so hard to contain, it quickly got out of control, with birds and other animals eating the fruit and then spreading the seeds. It is especially established West of the Cascades. It does especially well in riparian zones due to the abundance of other species in these areas, which allows it to go relatively unnoticed until it has had a chance to establish itself. The shrub spreads through rhizomes underground, making it very difficult to remove. Cutting the canes to the ground, or burning thickets of Rubus armeniacus are ineffective removal strategies. The best practices for removal include digging up the rhizomes and connecting underground structures, and herbicides. ^ "Rubus armeniacus". www.fs.fed.us. Retrieved 2019-04-19.